Nowadays, in our modern time, humanity has managed to separate its self almost entirely from nature, which includes our animal relatives. It comes as no surprise that the majority of the human species is even afraid to consider themselves animals/mammals, much less related to them, or even displaying anything closely resembling animal behaviour. Before the dawn of the great industrialisation of the world, people have endeavoured to separate themselves from wildlife, the ecosystem, and the earth in general. Now, with the slowly diminishing number of tribal cultures, majority of humanity has become utterly divorced from the original state of living common to all inhabitants of the earth, considering most wildlife as a mere means to sustenance. Or worse, even a hindrance to the ever-growing tide of human progress. What people have largely forgotten is that wildlife, comprising of all animals, including humanity as a whole, contribute to ecological balance of the planet– a state that has become askew in the light of ongoing industrialization and profit. For many tribal peoples, the earth is more than just a plot of land where things grow. It is a living being unto itself, no different from the human body, comprised of millions of different organisms that as a whole help to maintain its overall health. The sheer amount of wildlife both known and yet to be discovered play a very integral role in maintaining the fragile balance that ensures the wellness of the earth. Each species functions with a specific role – predator, prey, decomposer, preserver, and in this way ecological balance is preserved. When considered from this perspective, the earth then becomes a host, with flora and fauna that grows to become beneficial organisms that make or break its health. Ultimately, the ecosystem no more than a reflection of its wellness or sickness, and humanity desperately needs to remember this. Many ecologists now understand that the ever-increasing mass-extinction of wildlife has adverse effects on the overall ‘health’ of the planet, but their own specific contributions to the planet’s wellness, in a grander scale, still remains something of a mystery. It is understood that each animal – from the largest to the smallest microscopic organism, possess in them inherent qualities that help to maintain the balance that makes the earth function as it should. With this in mind, the preservation of what little remaining wildlife that is left that becomes profoundly important. This idea, becomes more than just an activist activity, it is the inescapable duty of humanity. Sad to say, because most of the imbalance found in the planet today is caused by humanity’s ignorance, and we the people living at this time own the role to help preserve and conserve the finite ‘resources’ that the planet has to offer – mainly, the wildlife. It is important that this knowledge be made commonplace, and that our lives, in relation to the lives of other animals, be viewed as a stewardship of sorts. This is true, if we are to achieve the restoration of ecological balance of the earth. 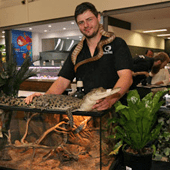 Fortunately, there are dedicated individuals who are active in promoting wildlife preservation in Australia, like the folks at Black Snake Productions.